MARTIN, Tenn. – For William Singer, a senior from Mount Juliet, participating in the Tennessee Governor’s School for Agricultural Sciences program confirmed his desire to study agriculture at the University of Tennessee at Martin and has ultimately led to a variety of academic and cultural opportunities. Singer chose to study agricultural production and minor in business to gain a background in different types of agriculture with a business perspective. TGSAS introduced Singer to many of the professors who teach agriculture courses at UT Martin, which later helped him feel more comfortable in his classes as a freshman. 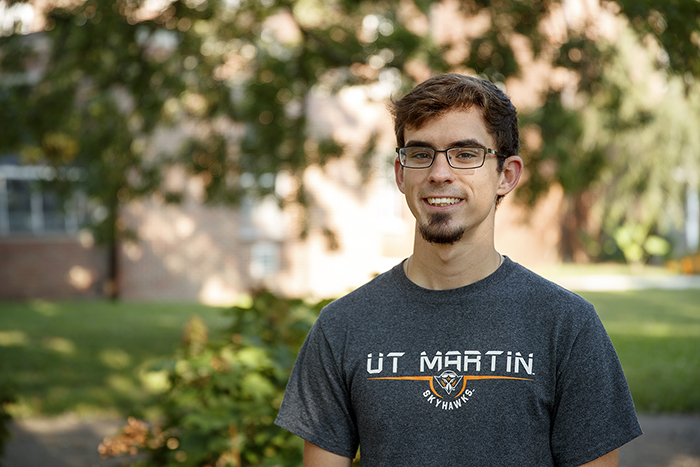 Singer was required to complete a two-year academic research project as part of UT Martin’s University Scholars Program, and he chose to conduct a qualitative case study of TGSAS to determine how the program affects participants’ future careers and educational pathways, as it did for him. In addition to his research, Singer also participates in the Ned Ray McWherter Institute, a three-year program designed to help students build upon their strengths, connect with mentors, increase awareness of domestic and international culture, and engage in business and public service ventures. “(NRMI) really helps you figure out what you are really comfortable with and what you need to work on before getting ready to go into the business field or graduate school,” he said. The second year of the program focuses on cultural development, and students spend the first semester learning about different cultures and the second traveling internationally. Singer traveled with his class to Greece and Italy in March 2017, and it was his first time out of the country. Traveling in college has given Singer new perspectives and is something he thinks more students should take advantage of while still in school. “It’s your chance to experience (travel) and not (worry) about something else at home while you’re away,” said Singer. The simple decision to attend the Tennessee Governor’s School for the Agricultural Sciences years ago has opened many unexpected doors for Singer, and he hopes to attend graduate school to continue his academic journey studying plant breeding and genetics. Singer is scheduled to graduate from UT Martin with his bachelor’s degree this spring.